In some contexts, the words “ocean” and “sea” are synonymous. This isn’t true in LoreGen. 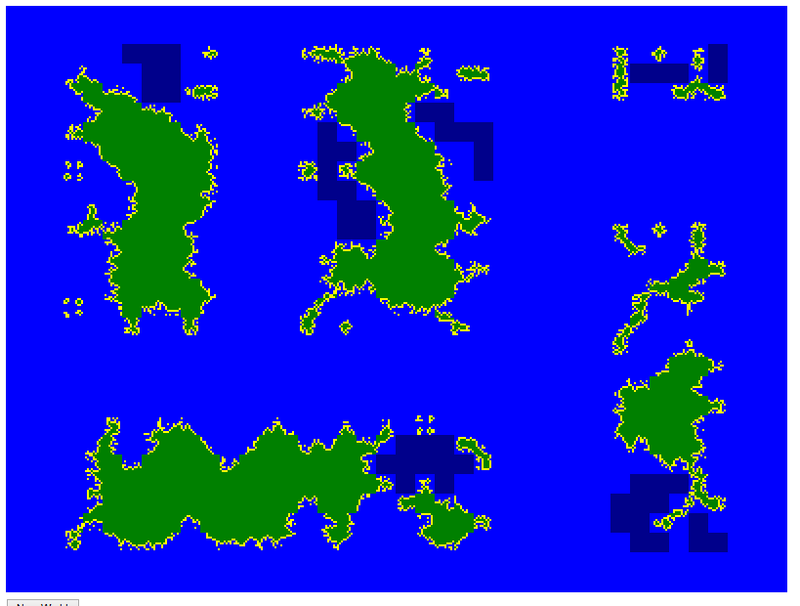 For LoreGen’s purposes, an “ocean” is a body of water that separates two continents. A “sea” is a smaller body of water that is partially or entirely inland. It’s effectively “within” a continent, even if it connects to an ocean (which it usually does). This reflects common usage when discussing geography: there are four major oceans, and they’re between continents. The seas are smaller and separate subcontinents are take up a portion of the sub continent. Here’s one more way to think about it: the largest unit of land is a continent; the largest unit of water is an ocean. We don’t bother breaking oceans down further in this version of LoreGen, but we do break down continents further. The largest unit of land within a continent is a region, which will be discussed in some upcoming posts; the largest unit of water within a continent is a sea. In SAT parlance, continent : ocean :: region : sea. Currently, seas do not pay that much of a pivotal role in LoreGen. Some continents have seas; others don’t. Unless the marked otherwise, it can be sometimes difficult to tell whether something is a sea or whether it was a victim of aggressive “erosion” from the random number generator. Only two of the continents ended up with seas, the top right and bottom right. Additionally, on the bottom right continent, the sea is not at the most logical place for a sea: the large channel between the bottom sub-continent and top sub-continent looks more sea-ish. However, this is a pretty average case for default configuration, which says that the minimum number of season is a continent is 0, and the maximum is 2-exclusive, so actually 1. In other words, a continent is equally likely to have zero and one sea, and won’t have more than that, under default configuration. Several rules for generating seas are defined in the World Rules data file, WorldRules.csv. First is the number of seas on each continent. This number is set by the rules entitled “Number of seas per continent.” There are two rules, a minimum and a maximum. The minimum value is inclusive; the maximum value is exclusive. In other words, you will always have fewer seas than the number set as the maximum. As you can see by looking at the dark blue regions, we now have several more seas than before. The next bit of data you can set is how big seas are on average as a percentage of the total size of the continent. This is defined by the rules “percent of continent in one sea,” which has a set min and max. Flubbing with these results in disparate sizes of oceans. 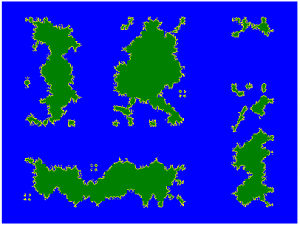 Bigger numbers make continents seem more island-esque and make continents more likely to be split into multiple parts. By default the min and max size for a sea are 5% and 15% of the total area of the continent. The last number used when configuring seas is the likelihood that the sea starts as a mediterranean sea. In other words, how likely is the sea to start inland, as opposed to starting on the coast? By default in version 0.1, seas have a 15% chance of starting as mediterranean seas. This number seems a bit low as a review it now and may change in future versions. Something else you probably notice by looking at the seas on these maps: they all fall into large blocks and don’t actually hit the coast of the land. This is because there is no management of the borders between geographic boundary of seas and the neighboring land the same way there is for coastlines. Seas are irregular in shape, unlike oceans. Oceans are always rectangles; seas are not required to be rectangles. They can be uneven regions. 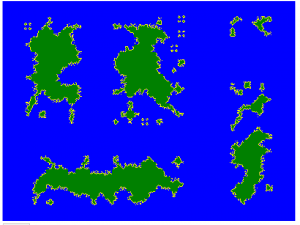 The shape of seas are formed by randomly selecting individual blocks of the continent as starting points for the seas and gradually growing the seas by one block at a time until the total area of a continent’s seas match the required size. As I noted already, seas are not a particularly important part of LoreGen as of version 0.1; they don’t play much of a role beyond changing the way a continent looks. But, in future versions, their role should continue to expand. 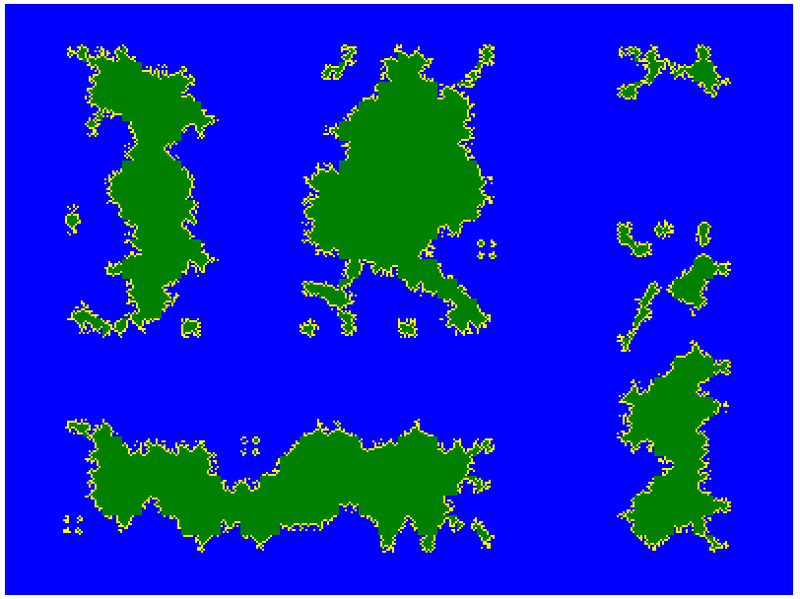 The next post takes a look at regions, the division of land within a continent.